The threepence (3d) (Irish: leath reul) coin was an Irish pre-decimal coin and a great favourite of golfers who often used it as a green marker. There were 4 threepences to a shilling and 80 to an old pound. The Irish name (leath reul) literally meant “half a sixpence” and, unlike many other Irish coins of the time, it did not resemble the UK sixpence, i.e. it was a different size and composition. Originally it was struck in nickel and was very hard-wearing – compared to the softer UK silver threepence which, up until 1946 comprised 50% silver, 40% copper, 10% nickel. In 1942, as nickel became more valuable due to war shortages, the metal was changed to cupro-nickel, i.e. 75% copper and 25% nickel. The design remained the same, despite the UK introducing a new threepence in 1937 – a much larger and heavier nickel-brass (79% copper, 20% zinc, 1% nickel) twelve-sided threepence coin and gradually phased out the small silver threepence from 1947 onwards. The Irish threepence measured 0.695 inches (17.7 mm) in diameter and weighed 3.23995 grams; this did not change with cupro-nickel coin. 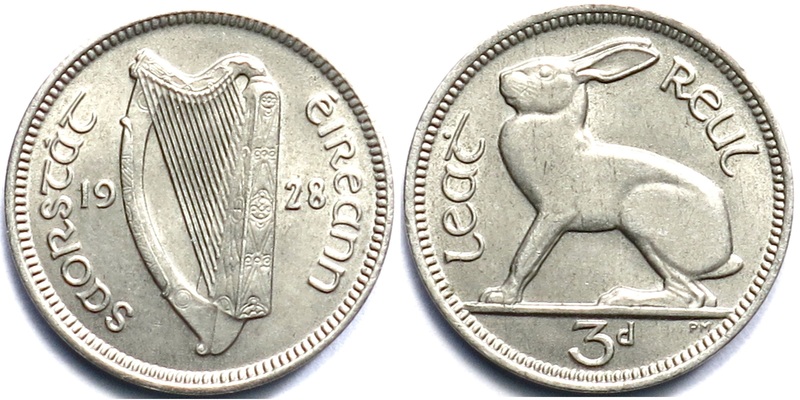 As with all other Irish coins, the Irish threepence was minted at the Royal Mint from 1928 to 1968, and ceased to be legal tender after Decimalisation Day in February 1971. Similar to the other seven Irish Free State coins, the Irish threepence was designed by the English artist Percy Metcalfe. 1928-35 Irish Threepence (obverse + reverse design). The designs used on the first coins of 1928 featured quite a few modifications to the original pattern submitted by Metcalfe. This was done to improve metal flow and other mechanical coin production reasons. The obverse featured the Irish harp. From 1928 through 1937 the date was split either side of the harp with the name Saorstát Éireann circling around. Saorstát threepences were only minted in four dates (years). The Irish threepence, especially the nickel issues (1928-1940), are very difficult to grade in the higher grades – especially between EF (extremely fine) and Unc. (uncirculated) since the metal is hard-wearing and not prone to corrosion. sharp details on the hare’s whiskers. From 1939 through 1968 the inscription changed to Éire on the left of the harp and the date on the right.